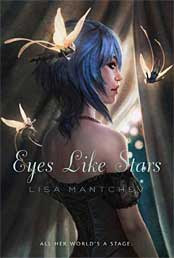 When I told Lisa Mantchev I was fascinated by the idea behind her upcoming book, Eyes Like Stars, she offered to send me an ARC (Advanced Reading Copy) to see what I thought. I loved it. Wholeheartedly and unreservedly. It's a fascinating concept, a visual banquet, and the kind of book that lingers in the imagination for days. Seriously, how can you not love a book with Hamlet's Ophelia, the fairies from Shakespeare's Midsummer Night's Dream, and a girl who dyes her hair cobalt blue but forgets to let it dry before she jumps head-first into her next adventure? 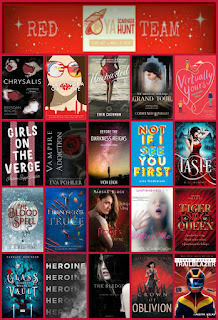 I loved it so much, I invited Lisa to be a guest on my blog for several posts leading up to July 7th, the day you can head out to your local bookstore and pick up Eyes Like Stars for yourself. 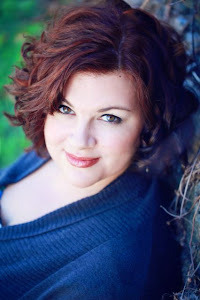 Lisa Mantchev grew up in the small Northern California town of Ukiah. She can pinpoint her first forays into fiction to the short stories she thumped out on an ancient typewriter. Playwriting came a few years later with an adaptation of Maeterlinck's The Blue Bird for May Day Festival in the fourth grade. She makes her home on the Olympic Peninsula of Washington state with her husband Angel, her daughter Amélie and four hairy miscreant dogs. When not scribbling, she can be found on the beach, up a tree, making jam or repairing things with her trusty glue gun. Eyes Like Stars is her first novel. Find out more here. Beatrice Shakespeare Smith is not an actress, yet she lives in a theater. She is not an orphan, but she has no parents. She knows every part, but has no lines of her own. Welcome to the Théâtre Illuminata, where the characters of every place ever written can be found behind the curtain. They were born to play their parts, and are bound to the Théâtre by The Book—an ancient and magical tome of scripts. Bertie is not one of them, but they are her family—and she is about to lose them all and the only home she has ever known. Mustardseed: I TOLD YOU she was talking about us. Moth: *ties up the aforementioned author with a licorice whips. * It's not like she was lying. You have frosting all over your shoes. Peaseblossom: You're going to get dog hair in your mouth again. You know these author types are terrible housekeepers. Moth: What happened to you? You're covered in gunk. Cobweb: *landing on the table and dripping on a stack of proofs* That drooling monster tried to eat me again!! Mustardseed: The dog, or the kid? Stay tuned next week to see if Lisa gets free of the licorice whips, rescues her pile of proofs, and manages to hide the cupcakes from four very determined fairies! So putting that on my TBR list. Oh.. that's funny! What a brilliant concept. Oh yeah, going on tbr. Of course, I'm gonna love this. It reminds me a bit of Pirandello's "Six Characters in Search of an Author"- but with a lighter sense of humor and the Bard. ND, WM, Katy - It truly is an awesome book. Danielle - I thought of you and how much you'd enjoy it the whole time I was reading it!